It seems like every day, we as professionals, are required to add new products and terms to our vocabulary. One day, it’s marketing automation. Another day, it’s agile marketing. Today, it will be mobile marketing. Keep this word handy because not knowing about it could allow your competitors to gain an advantage over you. Our world has shifted from what used to be a partially connected network. Response times are growing shorter and shorter when communicating with others. Mail is now mostly reserved for direct advertisements and bills. Most of the information we receive now arrives in the form of data packets over large interconnected networks. The satellites that hover above the misty dust of our atmosphere make us more connected than we ever were. Electronic devices have gotten smaller. The processing power of the desktop computer, while still amazing, is now over-shadowed by smaller devices thinner than a pencil and respond quickly with the gesture of a finger . Today’s laptops, tablets, and smartphones are brilliant. They are sleekly-designed mini-machines – glassy and metallic, with a touch of sci-fi. 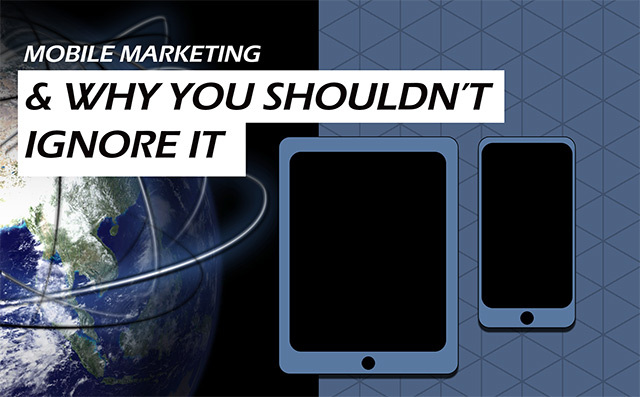 You probably own a tablet, smartphone, or both. The mobile medium is embraced by a large part of the world, and has been for some time. Though the mobile medium is not exactly new, there are great opportunities with endless possibilities every day. We are free from wires. Wireless. We can connect with almost anyone virtually. We can receive information based on our personal preferences and physical location. It was a natural progression that innovative technologists would make a stable, secure platform in which marketing and advertising could take place. What is new, is marketing on a mobile medium. It is new territory. Or, it could be considered territory with very few footprints. A potential for growth. A platform for reaching people that are connected and engaged. If you are someone that is curious by nature and willing to explore new opportunities for your business, you must know about mobile marketing. And, if there’s a chance – one chance that you could use mobile marketing to promote your products and services – take it! Your potential customers… your leads… are creating data right now that you could use to be more successful. For example, users of the mobile Twitter and Facebook apps on Android smartphones are very likely to be people you currently call customers. Users are sharing moments with their friends and followers. They are commenting on their favorite purchases. They are commenting about purchases they will make, or would like to make when finances permit. Everyone wants to be entertained, even your customers. Owners of the iPhone, iPad, and iPod Touch devices were entertained for hours on end in 2013 with a fun, but addictive game called, Candy Crush Saga. Games? That’s right. Your customers and clients are probably playing fun games on their smartphones between meetings. They are very likely to be jumping across broken stone bridges – leaping over thrusts of fire – running for their lives – as the Guy Dangerous or Scarlett Fox character in the game, Temple Run. In these gaming apps and other apps geared toward those who aim to be more productive are advertisements. These are not random ads. These ads are targeted. Advertisers are taking advantage of this opportunity to reach consumers, familiar or unfamiliar. Your ideal customer is out there and could be increasing your competitor’s bottom line. Data captured in this segment of the mobile medium is very valuable. This data gives analysts insight on trends, buying patterns, personal preferences, and favorability. Your ideal customer is providing other businesses with data that could be potentially increasing their bottom line and not yours. Should you ignore this? Probably not. Whether it be mobile marketing in apps, or on websites based on location, you should realize this still new and very fresh platform for promoting your business. Let me lead you as your mobile marketing guide. I invite you. I’ll be your mobile marketing guide. I’m the App-Lady and I can give your website the “mobile makeover” it deserves. We create mobile apps with all of the cool features you know and love like sharing photos, getting news and notifications, and more.